The exhibition Terribly Close: Polish Vernacular Artists Face the Holocaust was on display in the Ethnographic Museum in Kraków from December 1 to March 31. The exhibition featured Polish folk art that depicted the Nazi occupation of Poland. The works were created between 1948 and 2017: some were graphic, others metaphoric, others deeply empathic. The curators found these works almost literally underground: in museum collections storages and in private collections. They had never been displayed together in this way. 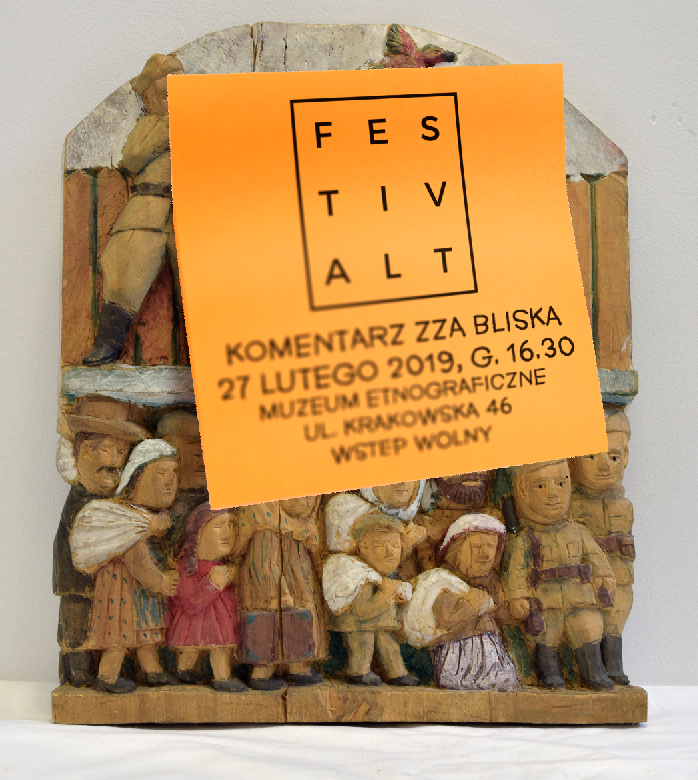 On Wednesday, February 27, FestivALT invited members of the Kraków Jewish community, as well as other locals interested in the content of the exhibition, to participate in an intervention: two of the curators led tours through the exhibition while participants responded to the artworks on post-it notes that they placed next to the works. We asked participants to write either 1) what they would ask or say to the artist, 2) what they thought the artist was saying through the work, or 3) what they would say to the curators about how the works were being shown. We organized this intervention in the spirit of a community consultation, in which the community implicated or depicted in or related to the creation of certain artworks are asked to give their input on how those artworks should be displayed. Community consultations are typically conducted before the exhibition is created. Our intervention took place months into its existence, so instead of trying to change the how the exhibition was being displayed, we used the intervention to create a virtual companion to the exhibition, an online alternative exhibition that includes the community’s feedback and commentary and suggested changes.